You've now added Anokhi Clothing Store to your itinerary. Get a sense of the local culture at City Palace of Jaipur and Gem Plaza. Shop till you drop at Jitesh Arts and Gallery Artchill. It doesn't end there: steep yourself in history at Amber Palace and see the sky in a new way at Jantar Mantar - Jaipur. To see other places to visit, traveler tips, photos, and tourist information, refer to the Jaipur attractions tool . New Delhi to Jaipur is an approximately 2.5-hour flight. You can also drive; or take a bus. In February, plan for daily highs up to 80°F, and evening lows to 55°F. 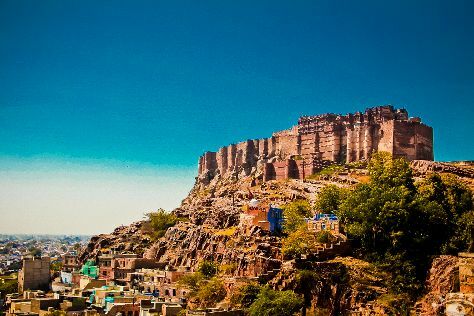 Cap off your sightseeing on the 4th (Mon) early enough to travel to Jodhpur. Kick off your visit on the 4th (Mon): admire the masterpieces at Umaid Bhawan Palace Museum, then get to know the fascinating history of Toorji Ka Jhalra (Toorji’s Step Well), then steep yourself in history at Mehrangarh Fort, and finally whizz through the canopy at some of the top local zipline courses and adventure parks. Keep things going the next day: pause for some photo ops at Jaswant Thada, then look for gifts at Mohanlal Verhomal Spices (MV SPICES), and then contemplate in the serene atmosphere at Shree Pal Balaji Temple. For more things to do, traveler tips, photos, and more tourist information, read our Jodhpur visit website . You can fly from Jaipur to Jodhpur in 4 hours. Alternatively, you can drive; or take a train. February in Jodhpur sees daily highs of 83°F and lows of 56°F at night. Finish up your sightseeing early on the 5th (Tue) so you can go by car to Udaipur. On the 7th (Thu), contemplate in the serene atmosphere at Jain Temples and then contemplate the long history of Jaisalmer Fort. To see other places to visit, more things to do, traveler tips, and other tourist information, you can read our Jaisalmer day trip planner . You can do a combination of flight and taxi from Udaipur to Jaisalmer in 9 hours. Alternatively, you can drive; or do a combination of train, flight, and taxi. You will leave for home on the 9th (Sat). Kick off your visit on the 6th (Wed): relax and rejuvenate at some of the top local wellness centers, then get engrossed in the history at City Palace of Udaipur, then stop by Gothwal Art, and finally get engrossed in the history at Bagore Ki Haveli. On your second day here, explore the activities along Lake Pichola, then view the masterpieces at Art Haveli, and then contemplate in the serene atmosphere at Ekling Ji Temple. To find where to stay, ratings, photos, and more tourist information, you can read our Udaipur driving holiday planning site . You can do a combination of taxi and flight from Jaisalmer to Udaipur in 9 hours. Alternatively, you can drive; or do a combination of taxi, flight, and train. February in Udaipur sees daily highs of 82°F and lows of 53°F at night. Cap off your sightseeing on the 7th (Thu) early enough to travel back home.